Part of the Art Forms in Nature series. The geometric shapes and natural forms, captured with exceptional precision in Ernst Haeckel's prints, still influence artists and designers to this day. This volume highlights the research and findings of this natural scientist. Powerful modern microscopes have confirmed the accuracy of Haeckel's prints, which even in their day, became world famous. Haeckel's portfolio, first published between 1899 and 1904 in separate installments, is described in the opening essays. The plates illustrate Haeckel's fundamental monistic notion of the "unity of all living things" and the wide variety of forms are executed with utmost delicacy. Incipient microscopic organisms are juxtaposed with highly developed plants and animals. The pages, ordered according to geometric and "constructive" aspects, document the oness of the world in its most diversified forms. This collection of plates was not only well-received by scientists, but by artists and architects as well. 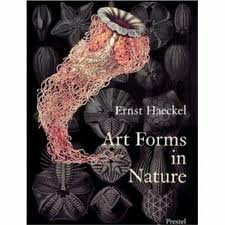 Rene Binet, a pioneer of glass and iron constructions, Emile Galle, a renowned Art Nouveau designer, and the photographer Karl Blossfeld all make explicit reference to Haeckel in their work.